Many people are confused about why Swerve no carb sweetener is 0 carb if there are carbs listed on the nutrition label. 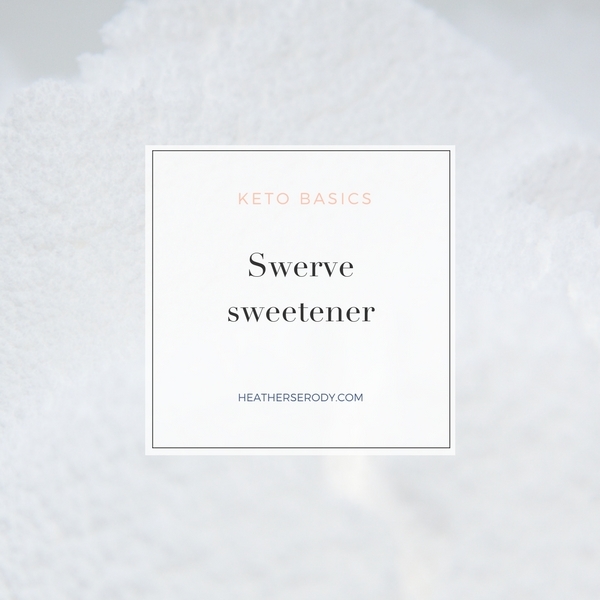 I recommend and use Swerve sweetener (confectioners only, the granulated stays crystalline) for my recipes because you can bake with it and it doesn't affect blood sugar or insulin. Swerve is a sweetener made from erythritol, oligosaccharides (fiber prebiotic) and natural flavors. Studies on Erythritol in humans show that it does NOT cause digestive distress (1), and has been proven to be very safe for human consumption. Double-blind, randomized control trial studies confirm that irrespective of sweetness level, the consumption of erythritol does not significantly raise blood glucose or insulin levels after eating. (2) You can get Swerve at Whole Foods or Amazon. Swerve is one of the only brands of erythritol made from non-GMO vegetables. Please don't be scared off by erythritol's scary-sounding name. Erythritol is your sweet friend. Oligosaccharides are prebiotics (also called inulin) which improve gut health (3) and actually may lower fasting insulin levels. Again, please don't fret about oligosaccharide's long and funny name. Like probiotics, they are good for you and may even be therapeutic. Swerve has less than 5 calories per teaspoon. If you are baking with Swerve it has 51 calories per cup. Although Swerve's nutritional information lists 5g of carbs per teaspoon, please know that the body doesn’t metabolize these carbs, they are taken directly up into bloodstream before they can ever get metabolized by the body. This is why the carbs in Swerve do not impact blood glucose or insulin levels, and that's why the nutrition information for my recipes that use Swerve do not reflect carbs from the Swerve. If you are using my fitness Pal to log your macros from the food you eat, use the Swerve ingredient that is adjusted to 0 carbs. and great news-I can now get Swerve at my local Publix grocery store, too. If your store is only carrying the granulated kind, talk to the store manager and tell him/her to please order the confectioners type. They are usually very happy to accommodate your request!